Inaugurated by: Shri Devendra Fadnavis, the Chief Minister of Maharashtra government. To encourage, assist and supervise young entrepreneurs. Atal Mahaaphan Vikas Abhiyan is named after former Prime Minister Shri Atal Bihari Vajpayee and a reason behind launching scheme is that cooperative sector is facing a crisis of funding. This new scheme will not only benefit cooperative sectors but also assist and promote many other weaker sections because in rural area cooperative sectors play an important role in development. So, it is the backbone of the provincial economy. This new scheme will strengthen and encourage pastoral area and it will create employment opportunity which leads to income generation. Atal Mahaaphan Vikas Abhiyan will also give assistance to the women self-help group and agriculture community to earn income and create job possibility for others. This scheme will boost the rural community and bring the standard of living up. 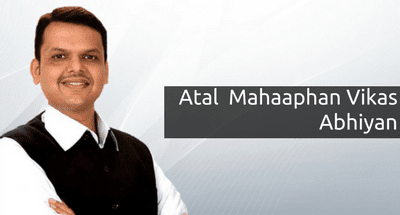 The Maharashtra state government has launched a new scheme Atal Mahaaphan Vikas Abhiyan to improve the life of farmers and women in a state, the state government will grant a handful of a fund to start a new business. The state government will aim to attract more private organizations to offer fund and promote the agricultural sector. This scheme is an effort to sustain and nurture the rural sector by improving the productivity. Atal Mahaaphan Vikas Abhiyan aims to double the income of framers at the end of the year 2022. The Maharashtra state government has decided to fund approx. 5000 cooperative societies to start a new business. To create awareness and better implementation of this scheme, The Maharashtra state government will run campaigns and drive in each district of the state. The Maharashtra state government will, first of all, do registration of primary agriculture cooperative societies who choose non-banking business either public, private or Cooperative Private Partnership (PCPP). The cooperative department, under the Maharashtra state government, has started to accept applications to set up the businesses. The main motive of this scheme is to increase the standard of living of farmers and women in the rural area. It also aims to inspire and assist young blood to take an initiative to set up new business. And all this leads to bring status up of a rural community. At present, cooperative sector is facing a huge crisis of finance to set up and operate a business. So, this is a try to give financial assistance. This effort will increase the performance of the corporative sector. Through this scheme, a state government will give financial assistance to the selected 5000 cooperative sectors for setting up and start a new non-banking business in a rural area. This scheme will benefit farmers and self-help women groups in a rural community. This will create employment opportunity and create a source of income. Under Atal Mahaaphan Vikas Abhiyan, primary agricultural cooperative societies will have to register with the state department.